What do you look for when booking a weekend away? I usually prioritize a location I’ve never explored before, then look for self catering, family accommodation for under R1000 per night and somewhere I can drive to in under 3 hours (especially since I have to wait for the kids to arrive home after school). The non negotiable aspects are that the house/flat/chalet should have a bed for each child and a double bed for the grownups to share and the kitchen is functional enough for me to prepare meals in. You see, despite having children, things like play areas, swimming pools, games rooms etc don’t hold all that much appeal for me as we prefer to do things together. We love exploring the town and prefer to walk as much as possible. I don’t have anything against holiday venues that offer these options but I have found that it’s not the kind of place you go to for peace and quiet especially during peak holiday season. So, Mount Ceder in the Cederberg ticked all the boxes for me. I challenge you to find a more tranquil environment just a little over 200kms from Cape Town. The Cederberg really feels like a different world. If I had to compare it to anything we’ve experienced before I could have to say it’s a little like the Karoo with lots of fynbos. Despite the fact that we have actually have 2 other holidays in “Ceres” before it felt so different. 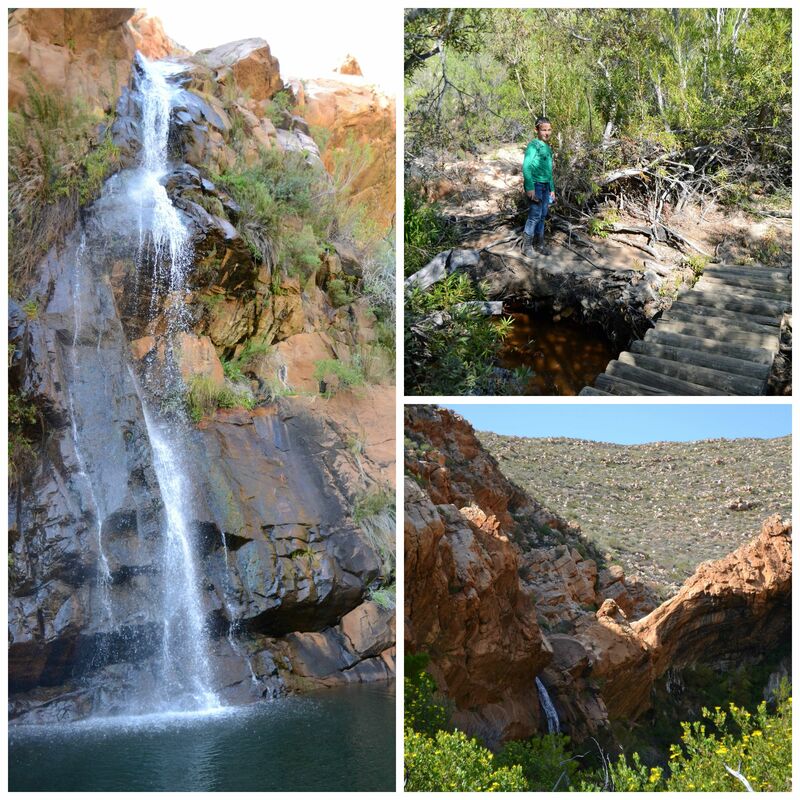 When we went to Klondyke Cherry Farm for the weekend, we took a long drive into the Karoo to find the Tankwa Padstal on the Saturday morning and the rest of the weekend we just explored the farm. While at Petervale Farm, we spent a lot of time on the farm itself and only really drove to the neighbouring town of Tulbagh on the Sunday afternoon. You see, when we stayed at Petervale Farm, we had the benefit of sleeping there for 3 nights and it really makes the world of difference to your holiday. The kids and I never sleep well on the first night in a new place so we didn’t get the rest we needed before we tackled a fairly jam packed schedule on the Saturday. We only really had 1 day to do everything because we had to check out by 10am on the Sunday and, maybe it’s just me, but once I’ve checked out, I feel the need to rather explore elsewhere. Anyway, let me get down to telling you about our weekend. We decided to stay at Mount Ceder after visiting their stand at the Getaway Show. Since we had just had our bath and toilet replaced, it was essential that we found somewhere else to sleep while the bathroom settled and everything dried properly. Since we arrived after sunset on Friday night, there was only time to unpack, eat supper and get the kids into bed. I don’t think I will do a weekend away again where I can only leave Cape Town after 3pm again. Driving the last hair raising 50kms on gravel road, at twilight is not something I would recommend for the faint of heart and arriving there just in time to climb into bed is really a wasted day. Saturday dawned bright and far too early after too little sleep but the kids were raring to go so go is what we did. We enquired at reception about the horse rides and, after finding out that the minimum age requirement is 10 years old (and my daughter is 7), AND R200 per hour per person, we scratched that off our to do list. Fortunately, there are a few things you can do for free and since we wanted the kids to sleep well, we made the choice to burn off as much of their energy as possible. 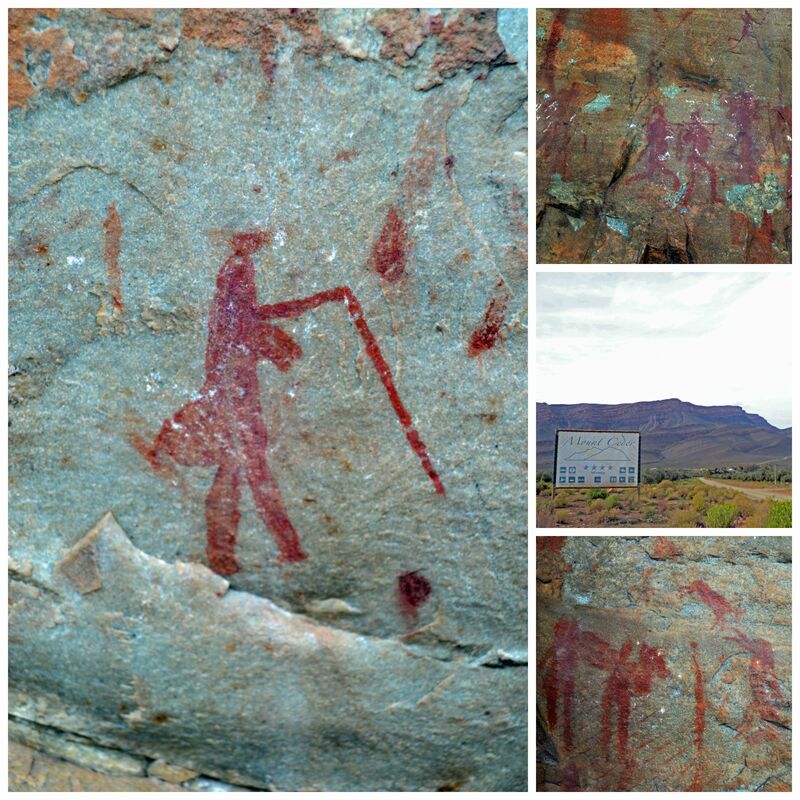 The Cederberg is well known for their Khoi-San Rock Art so we headed out in the car to look for then on one of the surrounding mountain ranges. The parking spot for the Varkloof location closest to us was 5 minutes away in the car but the walk to the cliffs took about 20 minutes. We parked between the house and the old Kraal and took the path heading towards the mountain in front of us. Just when we started wondering if we had misunderstood the directions and were actually heading the wrong way, I caught a glimpse of some graffiti on the rocks. On closer inspection, we found the rock art in the same area. I can’t actually put into words how disappointed I am that some kids decided to add their own “rock art” into the mix. There were only a few drawings on this site but enough for us to marvel at the detail and intricacy of the drawings. I became a bit nervous after spotting some baboon droppings so we headed back to the car. Since we finished quite early, we decided to drive back past Mount Ceder and onwards towards Ceres to do some waterfall hunting. This is where I must admit that I was grateful for our walks on Table Mountain the past two weekends. It served as good training for the rock clambering and steep slopes that we were faced with in the Cederberg. The walk down to the waterfall wasn’t too hard. Every time you wondered whether you were going in the right direction, one of these signs would pop up to encourage you to walk a little further. 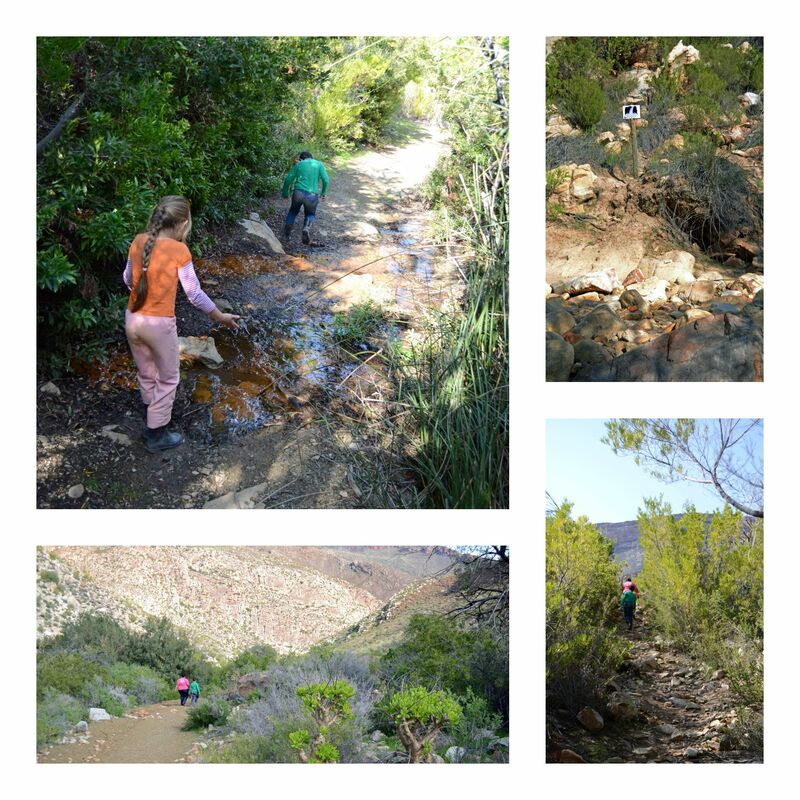 There were only a few places where the rocks were fairly big but the path is well worn and there is very little danger for kids who are familiar with the rules of the hiking (stay on the path, stick close together, don’t run too far ahead where the grownups can’t see you, walk in single file). I don’t want to give anything more away so I will just say, it is so worth it! Even if you are like me and are not a huge fan of hiking, go find this pool of tranquility. If you go in summer, pack a swimming costume and let me know what you think. The walk back to the car was hard but not impossible. We stopped as often as we needed to (even after my foot slipped off a rock while crossing the final stream and I ended up with a shoe full of mud). Once our (the grownups) heart rates settled back to normal (and the kids continued to run up and down a hill full of gravel in the parking area) we drove a little further towards Ceres to see if we could find cellphone reception. I’m happy to report that we found a small pocket of reception (Vodacom) 10kms from Mount Ceder (towards Ceres). We didn’t venture further than this because the kids were finally showing signs of tiring and started bleating for lunch. Does this sound like your kind of weekend away? We found our time there far too short and plan to stay there as part of a longer trip sometime in the near future. Amazing things here. I’m very glad to peer your article. Thanks a lot and I am having a look ahead to contact you.